It’s a rainy June afternoon in KwaNonqaba, an area of informal settlements and state-subsidised housing on the outskirts of Mossel Bay. 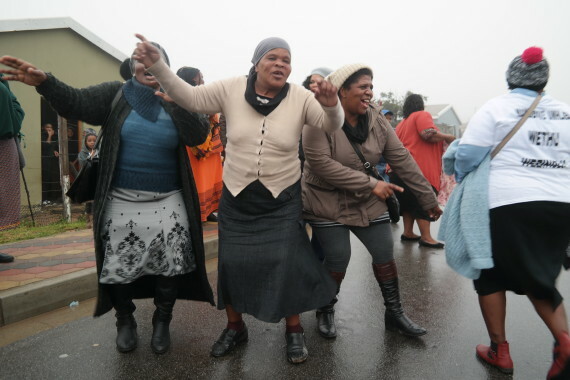 Singing arises from a tent pitched nearby a newly finished house – FEDUP members awaiting the arrival of Western Cape MEC for Human Settlements, Bonginkosi Madikizela. Among the group is FEDUP saver, Norman Bles, homeowner of the newly finished house. The day marks the official opening of his house – as well as four additional FEDUP houses. 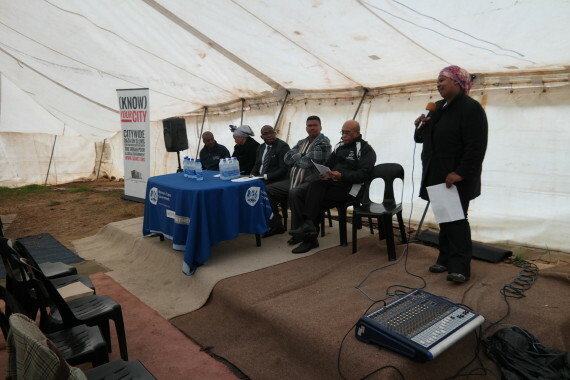 It also marks a breakthrough in the relationship between Mossel Bay municipality and the local groups of FEDUP savers – the beginnings of a partnership after over a decade of negotiations. 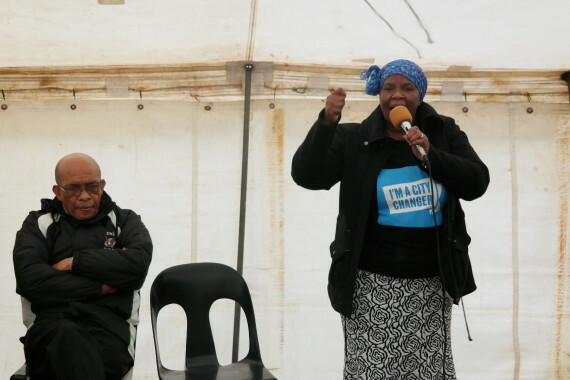 Thozama Nomnga, Western Cape coordinator for FEDUP, recounts how in the early 1990s the movement had built 33 houses in partnership with the municipality. 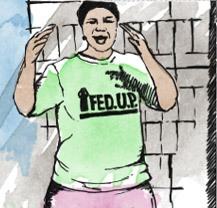 After a period of disengagement, FEDUP returned to Mossel Bay in 2006, re-connected with old savings schemes and the municipality, particularly around the KwaNonqaba housing project, which, at the time, was pegged at 110 houses. Due to changes in leadership and member affiliation to savings schemes, the municipality eventually pledged 35 houses in 2013. 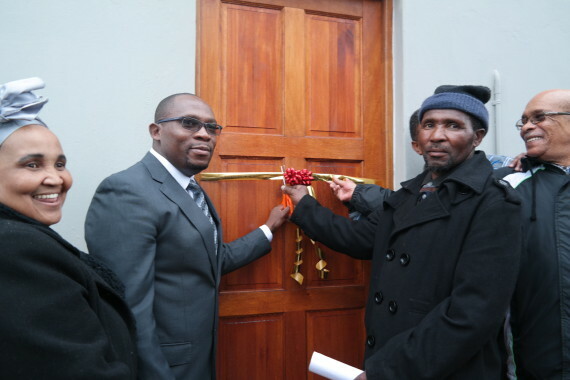 On 2 June 2015, the completion of the first 5 houses was officially celebrated along with the formal opening of the new house of Norman Bles. 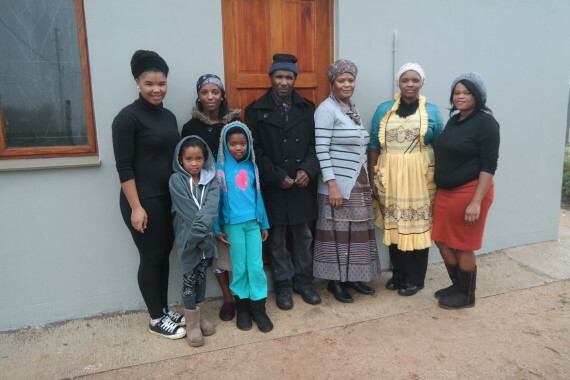 FEDUP member, Norman Bles, with his family infront of the newly finished house. As Norman Bles, reflects on his journey with FEDUP, he explains that he has been waiting for a house since 1993. Originally from Mandela Zone 5, he began saving with (what is now called) FEDUP in 1993. Over the years he left and re-joined the Federation several times – in the early 1990s due to a perceived lack of municipal support for housing and later due to uncertainties in the saving group leadership. During the constant changes in membership and saving participation, Norman speaks about his encounter with a fellow saver, who emphasised the importance of savings. 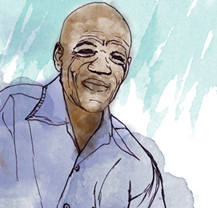 This encouraged him to re-join the movement and eventually form his own savings scheme. He explains how together with FEDUP he continued negotiating with the municipality for housing. While FEDUP celebrated the completion of 5 houses, the road ahead is a long one. 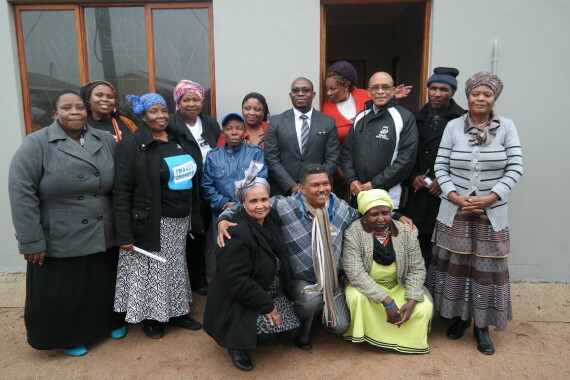 After over a decade of negotiations with Mossel Bay municipality and repeated submissions of project plans, the municipality seems receptive to a community-centred approach and to the People’s Housing Process (PHP). For Thozama, this certainly indicates the potential for partnership. Yet in order to build a strong partnership, the challenges need to be addressed – particularly in terms of delays in implementation. What underpins a people-centred partnership then? “As FEDUP are are not saying people must grab land. People need to negotiate with government. We respect the government and our councillors. But the government also needs to respect us as communities. Because if we are not there, there will be no government”.